Shopping in Downtown Tauranga | POMS AWAY! Young people complain that there’s nothing for them to do in Tauranga, but that’s rubbish. I love Tauranga. 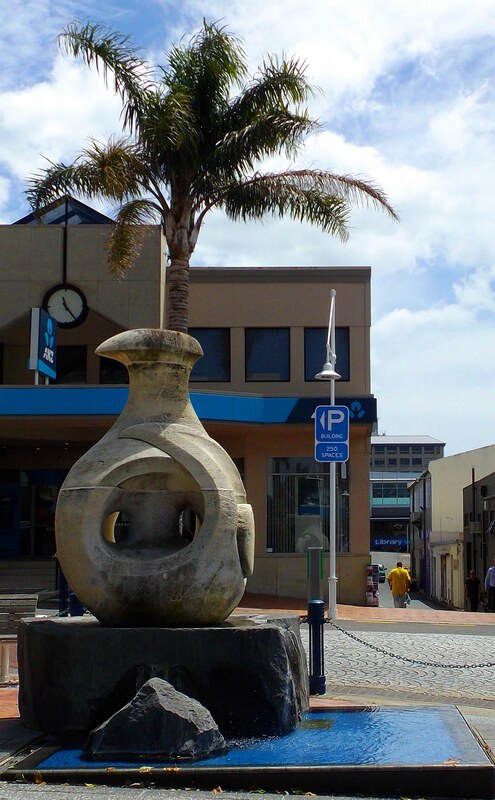 My favourite thing to do is go shopping in the city centre – well, town centre, really; Tauranga’s a tiny city. It’s a great place to shop – far better than the centre of Auckland in my opinion, unless you’re looking for teenage/twenty-something clothing; there isn’t much of that, admittedly, when compared with the range of clothing available for middle-aged women, though I’ve never had a problem finding what I want. It’s the non-clothes shops I like: the knickknack shops, the bookshops and the gift shops. They’re simply more unique than the equivalent shops in Auckland, and they’re all located in one convenient little area. It’s true that there aren’t as nearly many bookshops as there used to be, (and I lament their loss in a previous post, Killing the Thing We Love: The Demise of New Zealand’s Bookshops,) but more knickknack shops are popping up all the time. And only some of them are twee to point of being sickening. Shopping in downtown Tauranga is fun and extremely pleasant – for women, at least. The streets are all good-looking and there are cafes galore. I would like to make special mention of the Chantilly Cream Vintage Tea Shop, though. It’s lovely, all decked out like your posh grandmother’s living room for high tea and scones. For all its traditional charm, the range of different teas it has encourages you to try something new, such as a chocolate-flavoured tea, or perhaps vanilla and citrus. The teas come in beautiful cups, and each teapot has its own unique cosy. It has a sense of ceremony about its tea that other cafes just don’t, and its food is very good too. The menu is limited, but each item on it is scrumptious and arrives in a timely fashion. The staff are nice, the atmosphere is friendly, and there are tins of tea available for you to buy as gifts. Well worth a visit. But downtown Tauranga isn’t all tea and trinkets. There’s a free-to-enter art gallery, two cinemas, a theatre, a library, and a whole array of fashionable bars and restaurants. These are located along one long seafront street called the Strand. Walking along the Strand on a sunny day is brilliant. 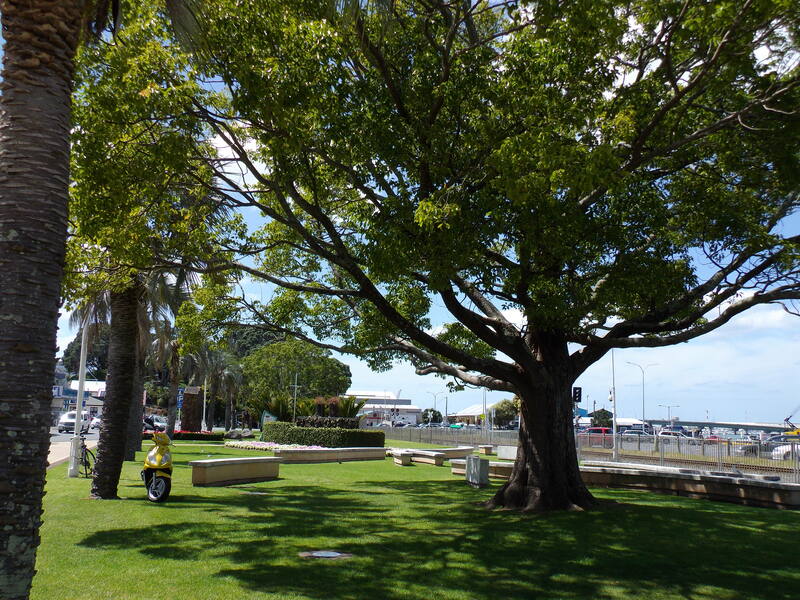 There are fountains, gardens and a wonderful playground, all overlooking the Tauranga Harbour. You can go on cruises around the harbour, including ones that take you out to see dolphins. As it happens, my two favourite Tauranga restaurants aren’t actually on the Strand. The sumptuously decorated Collar and Thai lies above the shops on Devonport Road, next to the Rialto cinema. Every dish there is just exquisite and the staff are delightful. The Café Versailles is on the neighbouring Grey Street, and is quite simply the best French restaurant I’ve come across in my life. (Admittedly I haven’t yet been to France.) If you want a heart-warming atmosphere and mind-blowing food, this is the place. Seriously, if you’re travelling around New Zealand, don’t just pass through Tauranga on your way to Mount Maunganui. 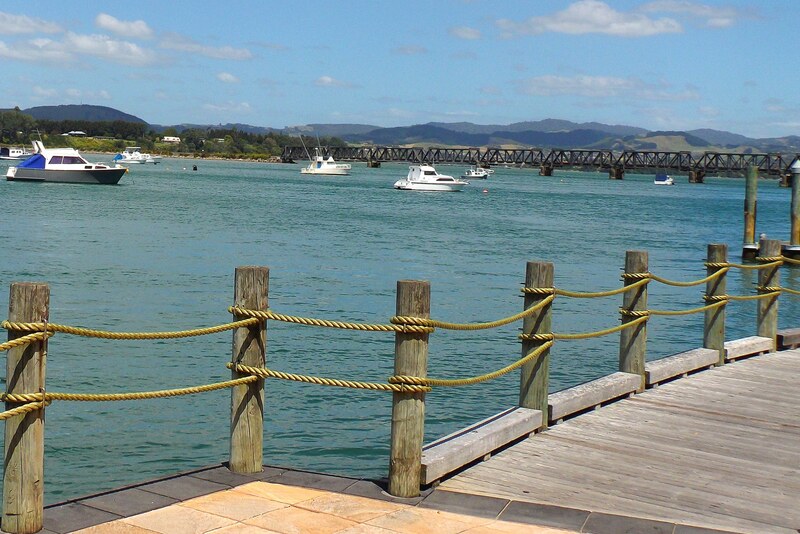 Spend a day sampling the delights of Tauranga’s CBD. For more places to go in Tauranga, see my Top 10 Things to Do in Tauranga list. This entry was posted in North Island, Places and tagged Bay of Plenty, Cafe Versailles, cafes in Tauranga, campervan Tauranga, Chantilly Cream, Collar and Thai, Mount Maunganui, New Zealand, New Zealand holiday, restaurants in Tauranga, shopping in Tauranga, Tauranga, to do in Tauranga, Travel, vintage tea. Thanks for the great blurb about our cute little tea shop Chantilly Cream Vintage Tea Shop. We love it too!!!! Come in and check us out everyone.